Harper Creek Falls is in two main sections, the top being a little higher than the bottom. Both are slides, with the top again being a little steeper. There's a pool in the bedrock between the slides, and a huge, round, clear plunge pool at the base - a very popular spot for swimming during the warmer months. The falls is surrounded by expanses of bedrock and huge boulders, especially on the left looking up. Tall trees loom above and light up during fall color. 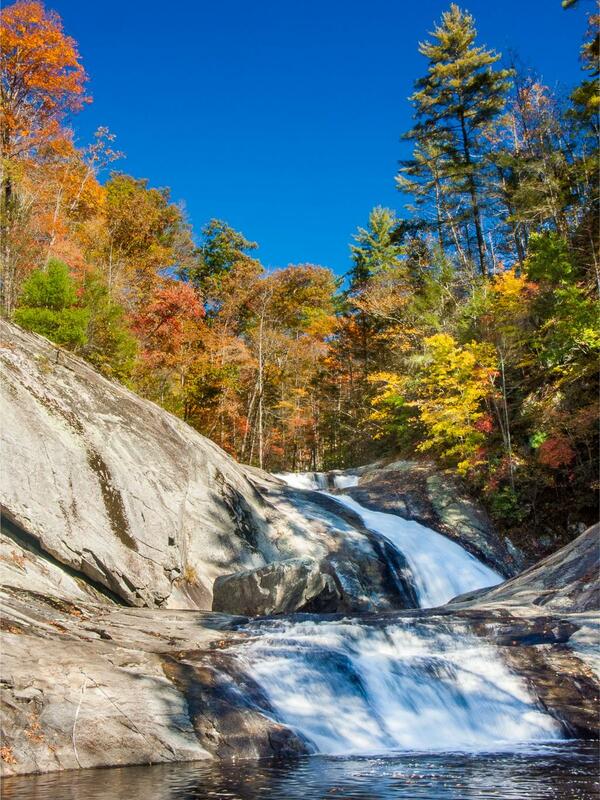 This is easily one of the finest waterfalls in the mountains! From Morganton, head north on NC Hwy. 181, which narrows to 2 lanes at St. Mary's Church Rd. Go 8.7 miles further and turn right on Brown Mountain Beach Road. Go 5.1 miles and turn left onto Wilson Creek Road (State Road 1328). The signed parking area is on the left after about 7 1/2 miles (1.7 miles beyond the Wilson Creek Visitor Center driveway). The Harper Creek trail (#260) begins at the back of the parking lot and climbs steeply uphill, through switchbacks, joining an old road bed on the way. It crosses over the ridge, where another trail (Yellow Buck - #265) comes in from the right. Keep going straight, downhill now. The trail will come to Harper Creek just past a section high above the creek which can be a bit narrow due to erosion. The trail passes through a big primitive camping area. At just under a mile from the parking area, Raider Camp Trail goes left. Bear right, uphill, on the Mountains to Sea Trail, blazed white. After about another 0.3 mi., a level side trail leads left to the falls while the main trail goes right (steeply uphill). Take the left path, which ends above the falls. If you want to scramble down to the huge plunge pool below the falls, a steep side path goes straight down. It comes out on a sloping rock face above the pool, with a sketchy rope tied to the trees to ease your descent if you so choose.